In September 1939 a young art student named Jack Chalker was looking forward to taking up the post-graduate scholarship he'd recently won to study painting at the Royal College of Art. Instead, his call-up papers arrived and the Second World War swept him away on an adventure which was to culminate in the nightmare of three years labouring on the Burma Railway. Here, his talent as an artist and an illustrator found an unexpected and, at times, gruesome outlet, chronicling not only the misery, squalor, savagery, heroism and fortitude of the prison camps, but also the horrific reality of the diseases which attacked them, the wounds their Japanese and Korean guards inflicted and the genius for improvisation with which the medical staff saved whatever lives they could. In doing so Jack Chalker captured for posterity a picture of life at the limits of human endurance, where his survival depended on a genius for improvisation. 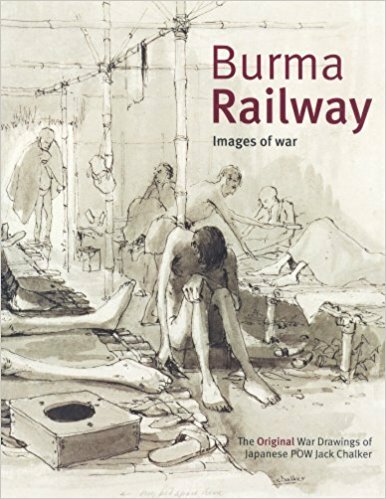 This brilliant artist has chosen to revisit his terrifying past, in BURMA RAILWAY, to write a new and gripping commentary to accompany his artwork and to bring to a new audience the reality of the struggle which our grandparents fought and won. Published by Mercer Books BURMA RAILWAY is a sure-fire winner from the history shelves, predicted to seize the imagination of the national press.